Some of you may remember that I'm working on a short film. It's been a long process. We started filming in April. I'm still working on post-production. The film only clocks in at 19:11, even with credits, but there's a lot of work packed into those minutes. And I'm still doing it. So you can imagine my surprise when I messaged a friend and said, "Do you know anyone who can help with audio?" And he responded with, "Yes, but can you get a 10-minute version of your rough cut together and preview some scenes at a film festival? In a few weeks...?" Imagine my surprise when I said yes. I worked really hard to get a cohesive version of half the film together that would be worth the time of a festival going audience, something that would show what I was capable of if the film got finished and a taste of what the film would feel like. I spent a great day in Helper, Utah, the most fascinating mining town nestled right up next to the mountains. I've always really liked Helper. My first novel (unpublished, probably will remain so) has a scene set there. And spending a day there as a visiting filmmaker was a treat. Assuming that half a rough cut wasn't enough to put me in awards competition and feeling sick from breakfast, I figured I'd skip the awards ceremony. This was definitely a mistake. 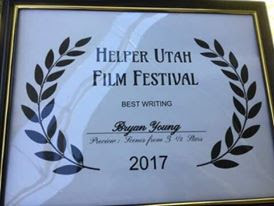 I ended up winning Best Writing at the festival. I hope this is a good omen as we move forward and finish the film and submit it to larger festivals. Although I'm not expecting much, I can still hope that this is the first of many to come. Also: If you happen to know someone who programs film festivals or buys short films... let me know... If you like what I've got of the short film so far, I'd love you to put me in contact with those people.